Cherry Blossoms Reach Peak Bloom on Target in D.C. The National Park Service says Washington's cherry blossom trees have reached peak bloom this week as predicted. The park service says the trees reached peak bloom Thursday. 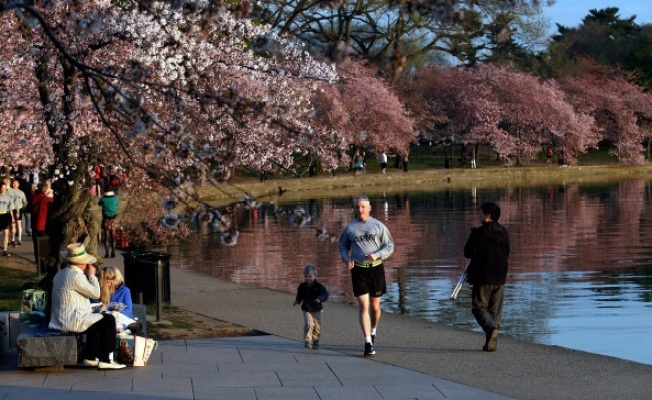 That means at least 70 percent of the trees around the Tidal Basin are blossoming with pink and white flowers. This year's peak bloom comes slightly later than average due to cold weather. The average bloom date since 1992 is March 31. Last year they reached peak bloom on April 9. The trees bloomed as late as April 18 in 1958. Park officials had predicted a peak bloom this year between April 8 and April 12. The Yoshino cherry trees usually bloom for seven to 10 days, said park spokesman Brian Hall. The length of the blooming period depends on the weather. Strong winds and rain can blow the petals off all the flowers within minutes, but the forecast looks good. Park officials encourage visitors to use mass transit or to park away from the Tidal Basin area to avoid traffic jams. The National Cherry Blossom Festival runs through Sunday. It includes a parade and a Japanese street festival on Saturday. Buildings around the nation's capital have been lit in pink for the festival. This year marks the 102nd anniversary of the gift of the cherry blossom trees from Japan as a symbol of friendship.